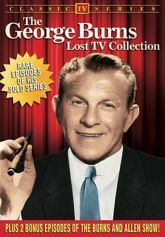 In 1958, after his wife and partner Gracie Allen retired, legendary comedian George Burns relaunched the long-running George Burns and Gracie Allen Show as The George Burns Show. The series retained the supporting cast from its predecessor, including Bea Benaderet and Larry Keating as neighbors Blanche and Harry Morton, George and Gracie's son Ronnie Burns as himself, and Judi Meredith as Ronnie's girlfriend. With Gracie retired, the program is about George's efforts to keep himself occupied as a producer. Blanche now acts as George's secretary, and tries (unsuccessfully) to keep his eyes off the buxom female guest stars. Without Gracie's daffy antics, The George Burns Show failed to find an audience, lasting only one season. The show's premise was prescient, however, as George then became a producer of TV hits like Mister Ed (1961-1966). After Gracie's death, George reinvented himself again as a ribald octogenarian, beginning with his Academy Award-winning performance in The Sunshine Boys (1975). George and the Private Eye: George is set on producing the detective story The Blonde Who Died Twice. Jack Benny and Bob Cummings have cameos. Breaking Up the Team: After they get turned down for a Broadway show, Ronnie and Judi break up their song-and-dance act. George plots to get the two back together. George Invests in a Record Company: George saves a record company from going bankrupt, only because he wants to record his own album! Rod McKuen appears as a folk singer named "Cottonseed Carter". PLUS TWO RARE EPISODES OF 'THE GEORGE BURNS AND GRACIE ALLEN SHOW'! The Property Tax Assessor: A man from the IRS audits the Burns' taxes, but Gracie doesn't let him get a word in. The Income Tax Man: Gracie's ideas of what qualifies as a tax deduction baffle George's accountant (played by Joseph Kearns).